Each jar contains 60 capsules. Each capsule contains approximately 600mg of kratom powder. Others talk about quality, but when it comes to actually doing something they fall short. That’s where Super Speciosa comes in. In a marketplace that is often described as “buyer beware” we have made quality control a top priority. These are so much easier. I am excited for the larger amount size coming soon, and hopefully lower prices. This is a good strain! These are fantastic. 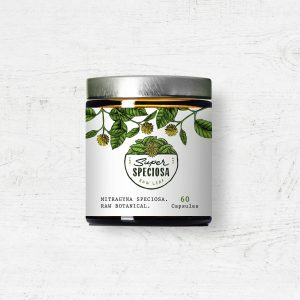 Super Speciosa has earned my trust over the years as my only source for kratom. Can’t say enough good things about them!